Opening day in on at press time; how will floods impact fresh and saltwater fishing? Members of Trout Unlimited help float stock trout on the Wood River. Volunteers float down the River in canoes and small boats and drop a net full of trout every 50 yards from Rt. 165 to Barberville Dam. Water levels must be manageable to float stock because it is dangerous to maneuver vessels in the swift moving water. This year’s effort is scheduled to start at 8:00 a.m. on April 22. Volunteers are welcome. Most anglers are wondering what impact the flooding will have on fresh and saltwater fishing both short and long term. The beginning of spawning season for many species and opening day for trout season is scheduled for this Saturday, April 10 at 6:00 a.m. and according to DEM it will go on with some adjustments and precautions in place. I checked in with a few local fishing and environmental experts about high water and flooding and its impact on fishing and here’s what they had to say. Gail Mastrati, assistant to the director/public information for the Department of Environmental Management (DEM) said (at press time) that, “Trout opening day will take place Saturday, April 10 but with some possible adjustments.” She said that the Carolina Hatchery suffered some fish loss and that anglers should check DEM’s web site prior to opening day for current information. New information would appear on their home page in new release form at www.dem.ri.gov . Visit the Fish and Wildlife page for specifics originally announced a couple of weeks ago. Captain George Cioe, Narragansett charter captain. “… newly stocked ponds might have trout swept away. And saltwater eggs may have been swept away from the shallows where the water has gotten warm enough for an egg hatch… worm hatch for example”. The Environmental Protection Agency cautions fishermen to limit contact with flood water due to elevated levels of contamination associated with raw sewage (particularly with the failure of Warwick and Cranston sewerage treatment plants) and other hazardous substances. This means all contact so avoid even spray and splashing, where protective gear… gloves, glasses, etc. US Coast Guard issued a safety advisory last week for all boaters and paddlers on lakes, ponds and rivers as well as coastal waters. Floods create stronger than usual currents, eddies and rips. Additionally, fallen trees and debris create hazards below the water that could lead to uncorrectable consequences for unsuspecting paddlers and small boats. The water is fast, frigid and unforgiving this time of year. So the Coast Guard advises waiting until things calm down (which I hope will be the case when this column publishes) before venturing out. Check with local authorities, DEM and or the Coast Guard on conditions before launching your vessel. Flounder. Captain Robb Roach of Jamestown related that lobstermen report good numbers of 10 to 12 incude winter flounder in their traps when moving pots. Robb’s lobstermen friends said that there is a lot of life around including a good number of conch. Cod fish bite still good but spotty during last week’s storms. Freshwater fishing. On April 22 Trout Unlimited will float stock 600 to 800 trout on the Wood River. This is contingent on the water receding and will be the second stocking, if DEM successfully stocks the first group in time for opening day said Peter Nilsen of Trout Unlimited. Volunteers are welcome and should meet at the "Check-in-Station" on Rt. 165 on the Wood River at 8:00 p.m. Coffee and donuts available. I like the idea of artificial reefs. Items placed under the water that are there because man put them there to attract fish. Studies show that one square yard of reef can hold 3,500 juvenile crabs and up to 135 immature fish. One square foot of structure just three to four feet high can support up to 100,000 tiny creatures like mussels, clams, crabs, worms and shrimp. Artificial reefs attract bottom fish such as cod, fluke and black sea bass. They also host non-bottom dwellers in areas above the reefs. An article titled “Reef Madness” by Gary Caputi (January 2010 issue of Saltwater Sportsman magazine) relates that the state of New Jersey is the poster child for artificial reef construction. New Jersey boasts 15 manmade reefs that have been constructed over the past 25 years. The list of items and material that dress the reefs is impressive and includes 7.5 million cubic yard of dredge rubble and demolition concrete, 158 sunken vessels, 397 tanks and armored personnel carriers, 269 subway cars, 31 railroad flatcars, 5,500 concrete reef balls and 16,500 other concrete castings. Caputi relates that although reefs only cover one percent of the fishable area off the New Jersey coast, reefs account for approximately one of every four fish caught by anglers. Studies in New Jersey show reefs not only concentrate fish, but they help expand stocks. There is eight to ten times more marine life on reefs than on open bottom. This article on reefs peaked my curiosity. Where are the artificial reefs in Rhode Island? A state roughly 37 miles wide and 48 miles long with over 400 miles of coastline has to have some artificial reefs. We do have artificial reefs in Rhode Island, however, the program is just three years old. The Rhode Island Department of Environmental Management (DEM) began construction of two inshore reef sites in March of 2006 and concluded work in August, 2007. The sites are off Newport to the south and both were built with debris from the old Jamestown Bridge. In 2007 one of the reefs was created off Sheep’s Point. The second reef site is located off Gooseberry. Coordinates of both sites can be found on page 13 of DEM’s 2009 Abstract of Marine Fisheries Rules and Regulations. The publication can also be found on DEM’s website at http://www.dem.ri.gov/. I asked Nicole Lengyel, the DEM marine biologist responsible for DEM’s reef project, if anglers are fishing the artificial reefs. I asked if there is sea life and fish on the reefs. Lengyel said, “Few fisherman are aware of the reefs and few are fishing them”. She said that this year DEM hopes to post a form on their website so anglers can report fish that are caught on the reefs. Richard Hittinger, chairman of the Rhode Island Saltwater Anglers Association reef committee and a member of the Rhode Island Marine Fisheries Council, was and has been instrumental in the artificial reef movement in Rhode Island. Hittinger states that last year he brought a diver out to dive on the reefs to check out the sea life. The diver found fish, documenting his findings with photos of fluke, scup and sea bass on and around the reefs. Hittinger said, “Fish are on the reef but divers and anglers must be aware of the dangerous rebar protruding four and five feet from chucks of concrete on the bottom”. Hittinger finds it disappointing that the State of Rhode Island still has no artificial reef plan in place. On a couple of occasions the RISAA reef committee wanted to continue to dress the reefs by sinking donated vessels on reef sites to add structure, but with no plan in place DEM was unable to grant them permission to sink vessels. So, yes Rhode Island has artificial reefs, but is lacking the resources to conduct appropriate tests to measure their success and lacks an overall artificial reef plan to facilitate the dressing of already approved reef sites. Reefs are good for recreational fisherman. 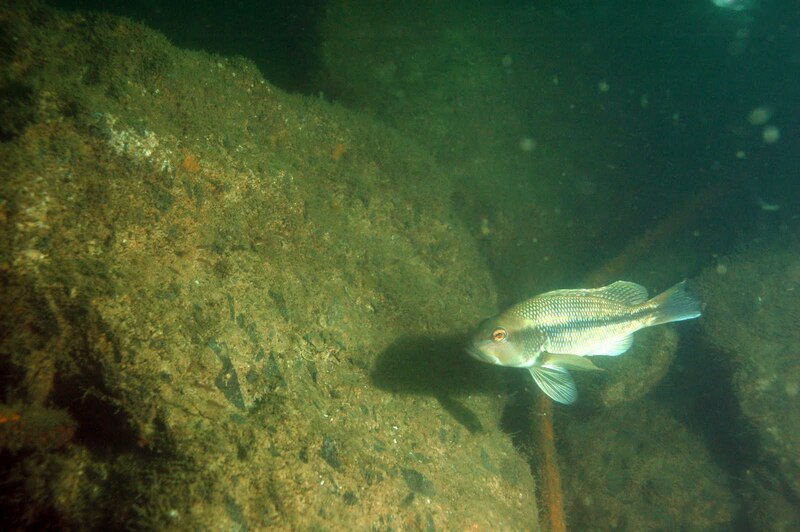 They attract fish, not only do they congregate fish, but they actually expand fish stocks. Looking at the lengthy list and volume of items used to dress reef sites in New Jersey, compared to the effort in Rhode Island is disappointing. Rhode Island needs an artificial reef plan from DEM so we can start to enhance our approved reef sites. Artificial reefs could have a huge impact on the recreational fishing industry in Rhode Island, an industry that already has a $300 million annual economic impact on the State. Last Saturday’s DEM family ice fishing training program was postponed due to poor ice conditions. The program has been rescheduled for Saturday, February 6 from 9 a.m. to noon at the Carolina Trout Hatchery in Carolina. As of this writing a limited number of spaces were still available. Cost is $7 per person or $5 each for families of three or more. Call Kimberly Sullivan at DEM’s Division of Fish & Wildlife at 539-7333 to register or for more information. As of this writing, DEM has determined that safe ice conditions now exist in designated areas at Goddard Memorial State Park in Warwick and at Lincoln Woods State Park in Lincoln. The ice in designated areas at both parks in over eight inches thinks. DEM’s Division of Fish and Wildlife stocked about 3,500 rainbow trout in served locations throughout the state this week and last in anticipation of winter ice-fishing. Locations stocked include Carbuncle Pond in Coventry, Olney Pond in Lincoln State Park, Round Top Pond in Burrillville, Silver Spring Pond in North Kingstown, Barber Pond in South Kingstown, Meadowbrook Pond in Richmond and Wood River in Exeter. A current fishing license and a Trout Conservation Stamp are required. The daily creel and possession limit for trout are two per day. Hands on demonstrations and seminars on fresh and saltwater applications on Lowrance GPS/SONNAR/RADAR/SIDE SCANS this Saturday, February 6, 2010, 9:00 a.m. to 3:00 pm at Wood Boat & Motor, 3630 West Shore Road, Warwick, RI. Check out the special pricing on all units, raffles and prices given away all day. On Sunday, March 7 from 9:00 a.m. to 3:00 p.m. Wood Boat and Motor will hold its annual fishing sale and flea market. The event is open to anyone wanting to sell their used or new tackle or equipment. All proceeds from admissions fees will be donated to The Homestead Group, a program for individuals with special needs. I had coffee with my son Geoff Wednesday and he said, “Dad, I would like to eat more fish but I don’t know how to buy it. Why don’t you write about how to buy fish? I’d bet a lot of people are interested”. So, if you like to eat fish and haven’t caught any to eat lately, here is a guide on how to buy fish, preserve it from the store to the stove and some general guidance on how to cook it. Ask your local fishmonger (a word of British origin that means fish dealer) how old the fish is you are interested in buying. I often ask what is fresh today, what just came in. Fish dealers, whether at the supermarket or local fish market in your town, expect customers to ask questions. And, they have every reason to be honest because if they say it is fresh, you buy it and it is not fresh odds are you will not be a customer very long. So do not be afraid to ask questions. Secondly…the old adage is true… if it smells like fish, it is not fresh. When fish starts to decompose (or rot) bacteria forms and the fish starts to stink or smell fishy. Fresh fish should has a water or ocean smell but not a fishy smell. If the fish is just starting to smell you may not be harmed by eating it, however, as we have all experienced, it will stink up your house when cooking. At a fish counter it is OK to ask to smell the fish and it is a common customer request. Next, look at the fish. Gian Russo, seafood team leader at Wholefoods in Garden City, said, “If the fish is a white fish like cod or haddock, it should be bright white in color not off white or grey. Also check the texture of the fish. It should be firm not mushy or soft looking”. When looking at steaks like sword fish the blood lines should be sharp and defined. If the fish is whole look at the eyes, they should be bright and clear. Overall the fish should look metallic and clean, if it is dulled or has discolored patches it is not fresh. Fish live in the water where temperatures are colder than the air. They are use to low temperatures that is why they should be iced when caught on the water. That is why you see it on ice or in ice at the fish counter. So, it is also important to keep fish cold when you bring it home. Fish (to stay fresh) should be arriving at your market in 24 to 36 hours from the time it is caught. Ideally, it should spend no more than three days in the market and in your refrigerator combined. That’s why it is important for fish markets to have local resources to buy from. Gian Russo says “You should plan on keeping it no longer than 48 hours at home”. My wife and I usually try to eat the fish we buy the same day it is purchased (or caught). Separate raw seafood from other groceries in your cart, shopping bag and refrigerator or freezer. All seafood should be refrigerated or frozen as soon as possible after it is purchased. As a general rule, refrigerated seafood should be used within two days. Live crabs and lobsters should be cooked the same day. Seafood should be marinated in the refrigerator, not on the counter at room temperature. Discard the marinade after use, as it may contain food-borne bacteria. Do not put it on any other foods unless they will be cooked. When cutting raw seafood at home, give that wooden cutting board the old heave-ho and instead choose a plastic one, which is less likely to harbor illness-inducing bacteria. Wash all cutting boards and utensils with hot, soapy water before and after they come in contact with raw seafood. Make sure all seafood is fully cooked at the proper temperature. Cooking time for fish is very important. Most people have a tendency to overcook fish. Once this happens the meat loses natural moisture and it gets tough. The general rule is cook fish 10 minutes per one inch of thickness (no matter what the cooking method). I generally bake at 400 degrees. My wife and I usually split 1.25 to 1.5 pounds of white fish filets (cod, haddock, halibut, etc.). I usually cook it for about 15 minutes depending on the thickness. As of last weekend, a limited number of spaces were still available in the Department of Environmental Management’s Family Ice Fishing Training workshop to be held on Saturday, January 30. Sponsored by DEM’s Aquatic Resource Education Program, the workshop will take place from 9 a.m. to noon at the Carolina Trout Hatchery in Carolina. The workshop is open to adults and children age six and older. All materials and hot chocolate are provided, and registration is required. Cost is $7 per person or $5 each for families of three or more. Call Kimberly Sullivan at DEM’s Division of Fish & Wildlife at 539-7333 to register or for more information. Shallow Water Striper University is still taking reservations for the March 12th to 14th event. The seminar is being held at the Sheraton Motor Inn in Warwick, RI, the total cost for the three day event is $89. The entire seminar focuses on how to find and catch more striped bass. Twelve local experts show and explain how they catch striped bass. To register send check to Shallow Water Striper University, C/O Wood Boat & Motor, 3630 West Shore Road, Warwick, RI 02886. Attention Debbie Wood. This is a unique opportunity to see firsthand how certain baits should be used, rigged, and worked in the water. The educational value of this seminar series is priceless. Captain Dave Monti has been fishing and shell fishing on Narragansett Bay for over 40 years. He holds a captain’s master license and a charter fishing license. Your fishing stories, comments and questions are welcome… there’s more than one way to catch a fish. Visit Captain Dave’s No Fluke website at http://www.noflukefishing.com/ or e-mail him ­­­at dmontifish@verizon.net . Fishmonger Gian Russo from Wholefoods in Garden City says you buy fish based on smell, looks and texture. Gian (who is the store’s seafood team leader) holds an Atlantic salmon farmed especially for Wholefoods customers. I love to fish and admire those that have made fishing their life’s work. In its most primitive form fishing takes from the water what God has brought us and we use it to nourish our bodies and for people like me and millions of other fishermen our souls. So in addition to the economics I seek to understand the fishing regulation debate. For example, the fact that federal law limits the type and amount of fish commercial fishermen can take and restricts the natural born right of all of us to fish. There are two aspects of the debate: to limit regulation and to preserve our fishery for all. This week about 3,000 fishermen rallied in Washington, D.C. at a “United We Fish” rally sponsored by the American Alliance of Fishermen. This group’s mission is “To preserve our nation’s fisheries for all Americans”. On their website at www.aafcseafood.org they go to great lengths to discredit just about all of the science-based annual catch data used to set limits to fishing though the Magnuson-Stevens Act (which was reauthorized by Congress in 2006). Our national fishery is managed by NOAA’s National Marine Fisheries Service. Their aim is to end overfishing of all stocks. As Eric Schwaab, the Service’s assistant administrator for fisheries, claimed this week in a press release “Ending overfishing is the first step to allowing a fish stock population to rebuild to a level where the stock can be fished sustainably for the long term”. Fishermen claim stocks are not overfished. For example, fishermen from Galilee, Rhode Island attending the national rally this week claimed species such as dogfish and fluke are not overfished as the National Marine Fisheries Service has claimed. They say data is faulty and basing policy on faulty data does not make sense. It is hurting fishermen, fishing families and fishing communities right here in Rhode Island. Limiting the amount of days fishermen can fish as well as catch limits has caused great economic hardship. Fishermen have gone out of business, sold their boats and to some this means selling a part of their soul. The National Marine Fisheries Service says that sacrifices have to be made to get fishing under control for significant long-term benefits to the ecosystem and fishing communities. They point to success stories such as the sea scallop industry which has increased from $84.7 million in 1994 to $370 million in 2008. They point to the healthy bluefish stock in the Northeast and off Rhode Island shores and in Narragansett Bay that provides a consistent, reliable fishing opportunity for shore anglers, party/charter boat anglers and the resulting economic benefits. The National Marine Fisheries Service estimates that once the nation rebuilds all fisheries, a plan they claim is on track and is required by law, the dockside value of our domestic fishery would go from $4.1 billion to $6.3 billion annually. Additionally, rebuilding the recreational fishery will help improve the economics of our nations' coastal communities. Annually, saltwater angling generates $82 billion in sales and supports more than 500,000 jobs as noted in a most recent NOAA report. Fishermen and federal regulators alike share a common goal of preserving our fishery so that it is sustainable. Fishermen benefit greatly from and support a sustainable fishery. But we have to be careful about how we achieve sustainability. I believe we have two key issues that should be addressed by both sides of the debate. First get better science. The fishermen know the science is faulty. They know what is pulled up in their nets. They report catches daily. Federal fishing regulators and fishermen have to focus on getting better data… better science… so more accurate policy can be created. Second, the federal government needs to strike a better balance between the economic well-being of fishermen, fishing families, fishing communities and the long-term health of our fishery. It is a balance that needs more attention. People are suffering. Captain Dave Monti has been fishing and shell fishing on Narragansett Bay for over 40 years. He holds a captain’s master license and a charter fishing license. Your fishing stories, comments and questions are welcome… there’s more than one way to catch a fish. Visit Captain Dave’s No Fluke website at www.noflukefishing.com or e-mail him ­­­at dmontifish@verizon.net . Many anglers have caught fish with tags. So I thought it would be good to review what one should do as well as review a few catch and release tips to ensure the fish you catch and intend to release have the best possible chance of surviving. Three organizations are responsible for most of the tagging in Rhode Island waters and the northeast; they are the American Littoral Society, the Hudson River Foundation and the U.S. Fish and Wildlife Service. All three groups use catch and release data to study the species… migratory patterns, growth rates, fish stock projections, etc. The research helps us understand and manage our fishery. Striped bass are the most popular species tagged; however, fluke and blue fish are commonly tagged too as well as a host of other salt and fresh water species. When you catch a fish with a tag (usually a dorsal loop tag or a belly tag), return it along with recapture information to the address on the tag. Record pertinent information immediately including species, location, length, weigh, the condition of the tag insertion site, and any other comments you have. The date of the trip and your name and address should be supplied as well. Some organizations offer incentives to those returning tags and surveys including cash awards ($5) and prize drawings. It is important to plan your catch and release efforts carefully to insure the fish you are not taking are released unharmed and have the best possible chance of surviving. This is particularly important with larger egg bearing striped bass. One way to enhance survival chances on the fish you plan to release is the use circle hooks. Circle hooks can be used very effectively when chucking or live lining with menhaden, or fishing with eels (three very popular fishing methods used to catch striped bass in Rhode Island). Here’s how circle hooks work…after the hook (and bait) are swallowed by the fish and it starts to run, the hook is pulled out of the stomach and slides toward the point of resistance on the fish’s jaw or lip and embeds itself in the corner of the fish’s mouth (and not in the stomach). The trick is not to jerk the rod to set the hook because you could pull the hook out of the fish’s mouth. Let the fish run, as it does, it will pull the hook out of its stomach and hook itself on the lip. Once this happens the fish is hooked so all you have to do is start fighting the fish and reeling it in. 1. Land fish quickly to minimize stress. 2. Avoid putting fish on deck and letting it flop around, keep it in the water as much as possible when removing hook. 4. Handle fish carefully. Do not use excessive force when grasping the fish. Do not put fingers into gill cavities or eye sockets. 5. Gently remove the hook to minimize damage. 7. Return fish to water quickly. Place fish gently in water in upright horizontal position. Move it back and forth in the water to force water across its gills. Once the fish revives, allow it to swim away. Fresh water: With the ice melt the freshwater bite is not active. Not many anglers reporting fishing at press time. Cod fishing seems to be just about the only saltwater species being taken. Parry boats out of Point Judith such as the Francis Fleet are experiencing good cod fishing off Block Island as the weather has cleared. Robb Roach of Kettlebottom Outfitters reports a good numbers of cod coming up in lobster pots these days. The biggest bite this weekend will be at Shallow Water Striper University being held March 12th to 14th at the Sheraton Motor Inn, Warwick, RI. The cost for the three day event is $89. To register contact Wood Boat & Motor in Warwick, RI at 401.739.4040. No one wants to lose a big fish. Not me, yet time and time again I lose fish because the gear is not right for the job, the tackle is faulty or because I wasn’t ready. Last year I lost a monster fluke (summer flounder) under the Jamestown Bridge. I was fishing for that doormat-sized fluke, yet the rig I was using just didn’t have enough muscle. I keep telling myself “You have to be ready, prepare before you drop your hook, before your fishing trip and before the season starts.” So this article focuses on getting your gear ready for the fishing season now so you don’t lose that big fish. Here’s a guide on what to do to prepare for the season. Each year, replace most used line. This is a judgment call as to what is meant by “used”. For example I have reels spooled with 40 lb. test monofilament line for fishing live bait. I used them infrequently last year. So I checked the line, it looked good… no nicks, snags or apparent stress so I did not change it. However, I changed just about every other rig with new monofilament, braid, lead or wire. Spool tight enough and then stretch the line, the first 100 feet (of monofilament line) to relax its memory to avoid bird’s nest tangles. Give your reels a good cleaning, particularly when the line is off. Grease where directed by manufacturer, often times, the reel is marked where to do this. If instructions are long gone do not hesitate to stop by your local bait or tackle shop to ask where to grease. Do not be afraid to ask questions, that is what they are there for, and they want your business. By the way, do not grease the drag, It is not meant to be greased, if you do, it will not work. Examine the rods for cracks and stress marks. Closely examine the eyes for chips or cuts that could cause line to snag, rub or break. Do not place hooks on the eyes or they will eventually create cracks that will cut line as it passes through. I get tackle ready in chronological order when certain species are fished… starting with tautog, striped bass, blue fish, fluke, tuna, etc. I then go through tautog rigs first, then the striped bass, etc. Make sure you have enough rigs to fish the species. Hooks should be clean and sharp (no rust), and strong enough for the size fish you are going after. Often hooks that come with lures are not quality hooks so I replace them with stronger hooks. Use wire leaders for blue fish and monofilament or fluorocarbon for striped bass. Blues won’t bite though the wire and striped bass will find it harder to see the monofilament or fluorocarbon leaders. Make sure leaders have no nicks or stress marks from fish pulling. If they do, replace them. I switched most of my leader hooks to circle hooks, I did this so I can safely catch and release undersized or unwanted fish (particularly striped bass). Circle hooks are designed to hook the fish at the corner of the mouth and not down in the belly. Freshwater fishing: Opening day is Saturday, April 10. Get you gear ready. Kim Bissonnette of Portsmouth, RI reported a healthy largemouth bass bite this weekend. On Saturday Kim landed nine largemouths in about 3 ½ hours of fishing. Kim will be reporting regularly on the freshwater bite this season. throughout the season. Saltwater fishing regulations and license. DEM director Michael Sullivan is expected to announce 2010 saltwater fishing regulations in the next week or two. Rhode Island will also likely institute its saltwater fishing license requirement this year. If they do not a federal license will be required. Stay tuned for 2010 regulations and details on the license law roll-out. Tautog. Spring tautog season opens, April 15 (if tautog regulations stay the same). The tautog proposal presented by the RI Fisheries Council was status quo with 2009… a minimum size of 16” with a split season… April 15 to May 31 (three fish/person/day), July 1 to October 16 (three fish/person/day) and October 17 to December 15 (eight fish/person/day). Osprey sightings which traditionally follow the herring up North. And, if the herring are coming north, the striped bass are right behind them. So this is a good sign. annual New England Saltwater Fishing show at the Convention Center in RI and is now preparing for their March 29, 7:00 p.m. monthly seminar. The seminar will feature two topics… Light Tackle Fishing in Narragansett Bay with Captain James White (owner of White Ghost Charters) and a discussion of the R.I. ocean Special Area Management Plan (SAMP) which aims to define zones for RI’s ocean waters. David Beutel of the Rhode Island Coastal Resources Management Council will speak about RI’s ongoing SAMP initiative.